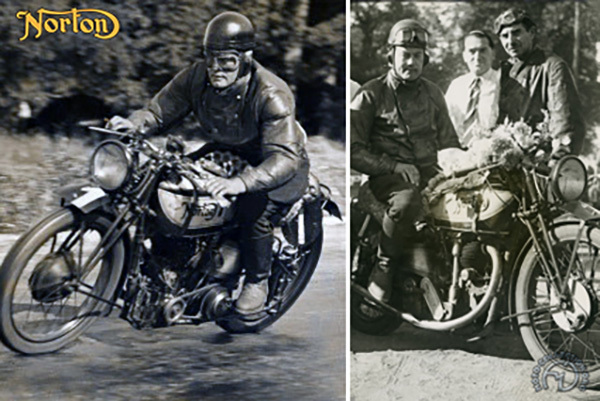 The finest machine available in 1936 for racing in the 500 solo or 600 sidecar classes was the Norton International. Made in a former chapel in Birmingham, the International was available as a roadster, a sports bike with kick-start, mufflers and lighting, or ready to race. The International 350 and 500cc ftrst appeared in 1932 after a series of international racing victories, from which they took their name. The first Internationals were virtually identical to the overhead-cam works racers ridden that year by Stanley Woods and Tim Hunt. As the works machines evolved, the purchasers of the production Norton Internationals were offered extra "racing" options every year. Hairpin valve springs, ftrst used on the 1934 works racers, were already part of the standard equipment in 1936, but among the many racing options were a cylinder and head and a cylinder in aluminum, a five-gallon gas tank, a larger oil tank, a megaphone tailpipe, racing tires, a supplementary lubrication system for the overhead-camshaft and an entire list of performance parts (supplied free of charge if the machine was ordered to racing specification). These included a dose-ratio gearbox without kick-start, an Amal racing carburetor and a heavy-duty clutch. A 596cc (82x113mm) engine designed for sidecar racing was available to special order. Ken Waller and his 1936 Norton International 500 in action at the 1993 Klausenrennen retrospective hill-climb in Switzerland.